In this unit you will learn more fretted notes on the first string, thirty-second note rhythms and different methods for notating swing rhythm. ‘E’ is in the third leger line above the staff. To play ‘E,’ fret the twelfth fret on the first string. ‘F’ sits on top of the third leger line above the staff. To play ‘F’ fret the thirteenth fret on the first string. ‘F♯’ and ‘G♭’ are enharmonics. To play ‘F♯’ or ‘G♭’, fret the fourteenth fret on the first string. ‘G’ sits on top of the fourth leger line above the staff. To play ‘G’ fret the fifteenth fret on the first string. 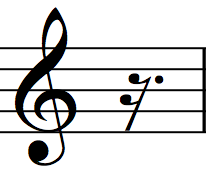 A thirty-second note sustains for one-eighth of a beat in simple meter. 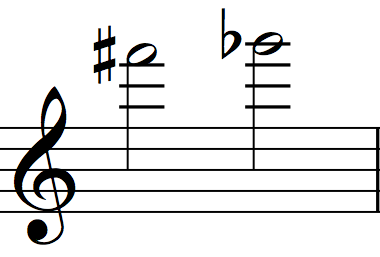 The thirty-second note can be written in two ways: either with three beams or three flags. This example contains four thirty-second notes.. The thirty-second note consists of a note head that is colored in, a stem and three beams. In this example, the thirty-second notes contain flags instead of beams. A thirty-second rest creates silence for one-eighth of a beat in simple meter. It consists of a diagonal line with three small flags. It’s impossible to count thirty-second notes in a methodical manner at a brisk tempo, simply because they proceed faster than most of us can count. Therefore, it is best to devote part of your practice to recognizing and playing different combinations of thirty-second and sixteenth notes. Aim to play them in relation to the pulse in an intuitive (not intellectual) manner. However, while developing this skill, it will help to slow down the pulse and count according to the method below. When this becomes manageable, speed up the pulse (little by little) until you count only the pulse, not the rhythmic sub-divisions of the pulse. Bear in mind that thirty-second notes are usually ornamental. When applicable, it will help to recognize them as a trill, turn, mordent, etc. Further, ornaments are often played with a greater degree of expression and flexibility because they are not as structurally important as melody. Despite this fact, many composers request that musicians perform thirty-second notes and ornaments with rhythmic precision. The dotted sixteenth note sustains for three-quarters of a half of a beat. 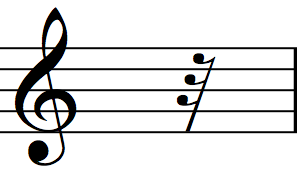 The dotted sixteenth note consists of a sixteenth note with a dot positioned close to the notehead. The dotted sixteenth rest creates silence for three-quarters of a half of a beat. The dotted sixteenth rest consists of a sixteenth rest with a dot positioned close to the symbol. 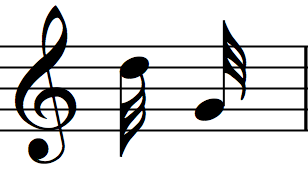 The dotted sixteenth and thirty-second note frequently beam together to form recognizable groups. Here are two combinations (view the video for a demonstration). Sixteenth and thirty-second notes frequently beam together to form recognizable groups. Here are three combinations (view the video for a demonstration). Many of you already know swing rhythm, as it is central to blues and jazz music. 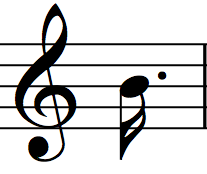 Swing rhythm involves a consistent and asymmetrical subdivision of the beat that (in most cases) can’t be accurately represented using the rhythmic symbols available standard notation. 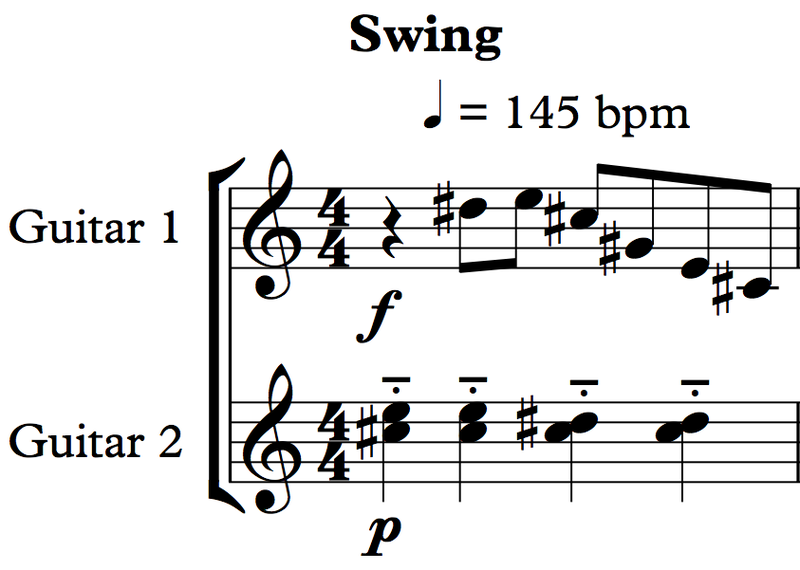 As a result, the notation used to represent swing is only an approximation of the rhythm itself. 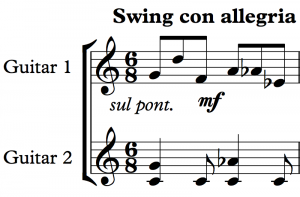 Nonetheless, musicians have attempted to notate swing rhythm in various ways for over a century. 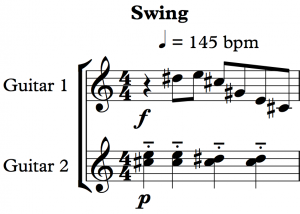 In nearly all cases, the word swing is written above the time signature. 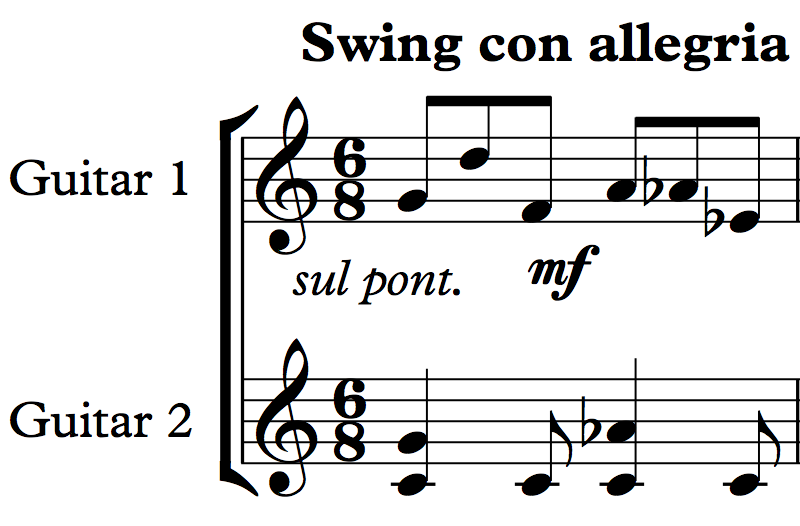 Most musicians advocate to notate swing rhythm in simple meter, as in the example below from Swing by Emile Porée. 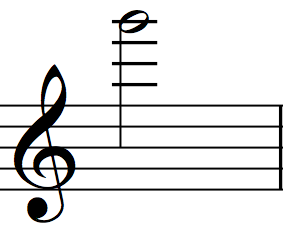 In this piece each eighth-note grouping (as seen in Guitar 1) should not be played straight—with equal subdivisions of the beat. Instead, each eighth-note grouping should be swung—with asymmetrical subdivisions of the beat. The beat subdivision in swing is often described as long-short or doo-bah. View the video for a demonstration. One type of swing rhythm that can be noted accurately is shuffle rhythm. Shuffle rhythm occurs when the asymmetrical subdivision of the beat adheres to a 2:1 ratio. 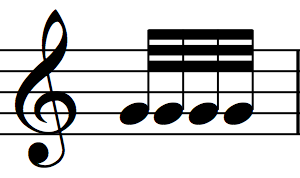 This rhythm is typically notated in simple meter (like other forms of swing) with the word shuffle written above the time signature. However, in the example below from Crazy Vertical Blues by Joan Greenwald, shuffle rhythm (as seen in the Guitar 2 part) is notated in compound meter. View the video for a demonstration. If you are interested in developing swing rhythm, bear in mind that there are many ways to swing! Further, the swing feel is achieved by a combination of articulation, phrasing and rhythm. Therefore, I suggest you listen to great blues and jazz musicians, emulate their swing and eventually play in a way that feels right for you. The next piece contains a refrain. The refrain starts at the Segno (on the first page, third system) and ends at the Coda (on the first page, fourth system). Notice that the piece is divided into four major sections, labeled A, B, C and D. When you see the Segno/Coda symbols in Sections B, C, and D jump back to the beginning of the refrain in Section A. At the end of the refrain, when you encounter the Coda, jump back to the Coda in either the B, C, or D sections.